Featuring a solid wood handle and silicone brush. Perfect for recipes like this! Bulgogi is a Korean marinated steak traditionally cooked on a tabletop charcoal grill. If you’ve got one, break it out and taste the flavor. Unfortunately, however, a tabletop charcoal grill might invalidate your home owner’s insurance, asphyxiate you if you don’t know what you are doing, or coat your kitchen in soot at the very least, so consider keeping your backyard grill handy this winter, or somewhere where it can be shoveled out quickly. These steaks aren’t your usual cut of meat—no sirloin or flank steak here. For this dish, we’ll be using tri-tip steaks—sometimes called triangle steaks—which are full of beefy flavor and decidedly lean. As with all lean cuts of meat, they can become tough quickly if cooked past medium rare, or just slightly more done. 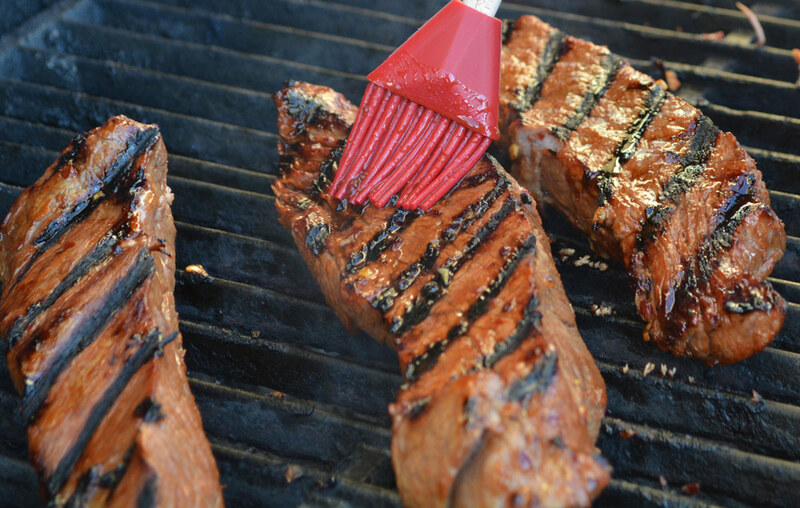 Depending on the size of your tri-tip, you might be able to cut four steaks from it. Or your butcher may have tri-tip steaks already cut for you. Either way, you’ll need 4 steaks, about 5-6 ounces each. If you will be cutting them yourself, the steaks are cut along the long length of the triangle. Keep this in mind when selecting the tri-tip. The marinade is heavy with salty ingredients and the marinating time is pretty short, just about half an hour on the countertop. Don’t give into temptation to marinate this for several hours, or heaven forbid, overnight. The resulting steak will be salty beyond edibility. So keep the marinating to the amount of time it takes to get the rest of your meal together and your grill preheated, charcoal or gas. Once these steaks come off the grill, you’ll have precious little time to prepare much else. They should have a few minutes of rest while you plate the rest of the meal and gather your family or friends to the table. Serve these steaks with your favorite kimchi, or if traditional kimchi is a bit much for you, consider making an Asian pear kimchi yourself. Instead of fermenting in the ground for several months, this kimchi has a fresh, tart heat that doesn’t scare off the uninitiated. If you plan to make this kimchi, make it first to give it about an hour to chill and marinate before serving it. We use Asian pears in this recipe, but if you cannot find them, you can choose a sweet, crisp apple instead or any underripe pear. Consider using a mandolin to evenly slice your pears and cucumbers to the same thickness. Just because the snow is falling, your grill doesn’t have to go into hibernation. It might take a bit longer to heat, and you might need to keep the burners on full blast to maintain the proper grilling temperatures. But the flavors of “fire meat” will certainly keep you warm on these chilly dark evenings. Mix all the ingredients for the marinade in a zip top bag. Place the steaks inside, pressing out the air and seal. Place the bag in a shallow dish allowing the steaks to sit in a single layer. Marinate, turning the bag every 10 minutes while you prepare your other dishes or preheat your grill. When you are ready, drain the marinade reserving it for basting. Grill the steaks, 4 minutes a side on a moderate grill, basting the second side with the marinade. Remove from the heat and allow to rest a few minutes before serving. Combine all the ingredients, minus the sesame seeds in a large bowl. Toss to coat. Allow the kimchi to chill for at least an hour before serving. Garnish with the toasted sesame seeds.